Water Utility Stocks: How Do They Stack Up by Q1 Performance? This water stock returned 8% in the first quarter of 2017 -- equivalent to an annual yield of 32%! 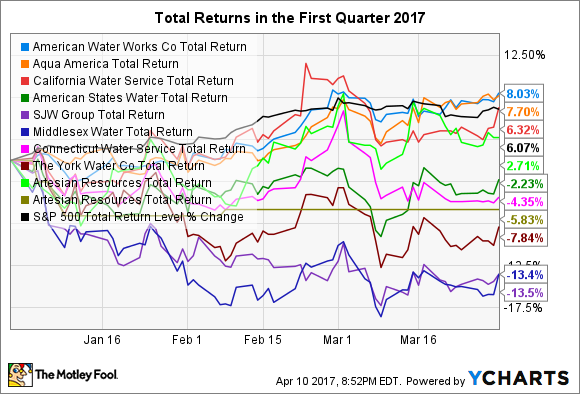 Water utility stocks' total returns in the first quarter of 2017, ended March 31, resembled the pattern a sprinkler makes with water -- quite disperse. Of the nine companies that operate in the United States, the stock of the industry's largest player, American Water Works (NYSE:AWK), led the pack with its 8% total return, which includes dividends. Annualized, that's equivalent to a return of 32%! SJW Group (NYSE:SJW), which isn't a pure play as it has some real estate operations, was the group's loser, with a return of negative 13.5%. We'll explore below why American Water continues to perform well; SJW's real estate operations likely were one factor that hurt it in the quarter, as this space is generally particularly sensitive to rising interest rates. Aqua America (NYSE:WTR) and California Water Service (NYSE:CWT) took the silver and bronze in the quarter with their 7.7% and 6.3% returns, respectively. These two companies are the second and third largest players, respectively, among water utilities operating in the U.S. Their stocks along with American Water's were the only three that beat the S&P 500, with its 6.1% return. This is a very strong showing for the broader market, as it equates to an annual return of 24.4%; the stock market's long-term compounded average annual return is about 10% before inflation and 7% adjusted for inflation. In addition to SJW, the water utility stocks that underperformed the market were American States Water, Connecticut Water Service, Artesian Resources, York Water, and Middlesex Water. All had negative returns, except the Class A shares of Artesian, which returned 2.7%; these are the company's shares without voting rights. American Water provides services to approximately 15 million people in 47 states and one Canadian province. Its regulated business operates in 16 states, while its market-based businesses include building, operating, and maintaining water and wastewater facilities for military bases throughout the country, and providing water and related services to natural gas exploration and production companies operating in the Appalachian Basin. Not only is American Water by far the largest player in the industry, it's also the most geographically diverse. These two characteristics provide it with advantages over its peers when it comes to acquiring smaller utilities in what's a very fragmented industry. Its size provides it with greater financial and technical resources, whereas its geographic diversity means that it has a larger pool of potential acquisition candidates from which to choose. That's because utilities usually expand near where they currently operate, as it's more cost-efficient. Wall Street analysts expect American Water's earnings per share (EPS) to grow at a compounded average annual rate of 7.4% over the next five years. This rate is the second-highest projected among the pure plays in the group, trailing California Water Service's 9.7%. The latter's stock is riskier, in my opinion, because a sizable portion of the company's operations are in its namesake stake, which makes it more vulnerable to drought conditions. As for American Water's dividend, it's a modest 1.93%. However, the company has raised it every year since it went public in 2008. 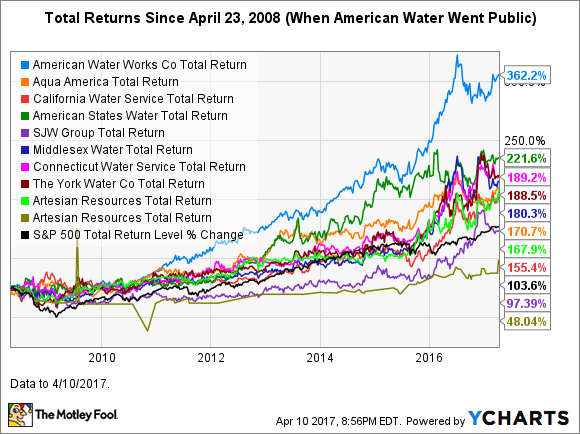 Perhaps not surprisingly, American Water's stock isn't only just the best-performing in Q1, but also tops over the long term. Water utility stocks, as a group, have had a great run over the last few years. We can attribute this in part to historically low interest rates; in such an environment, income-seeking investors flock to dividend-paying stocks, such as utilities, as the yields on bonds are pitifully low. Some catalysts also brought attention to the group, notably Flint, Michigan's egregious water crisis and California's epic drought. A couple years ago, investors could have chosen a winning water stock by throwing a dart at a dartboard with the names of the nine water utility stocks that operate in the U.S. tacked onto it. Not only have all nine of these stocks outperformed the broader market over the three-year period, through April 12, but most of them have simply crushed the market. In mid-2016, most of these stocks began pulling back due to expectations that Federal Reserve interest rate hikes were on the horizon. Indeed, the Fed edged up rates in December and then again in March. Mind you, rates are still near historic lows, so there's no reason to flee the group entirely. With more rate hikes widely predicted to be coming, however, good stock selection will become even more important in this group. American Water remains the best long-term bet in the group, in my opinion, thanks largely to its industry-leading size and geographic diversity.